Anyway, I’ve completed all the explicit challenges in the game, which leaves me with the implicit ones. Creating a stable ecosystem is actually quite easy: all you really have to do is throw in some plants and refrain from overharvesting them. Which raises the question of why you need animals in the system at all. There’s one species of plant that’s carnivorous, and another that supposedly uses an animal to spread its seeds, but for the most part, plants in this game don’t benefit at all from having animals around. But adding animals to the mix is crucial to exploiting things for the city (in the same way that cows allow us to indirectly eat grass), and also for maximizing your “bio-score”, which seems to take biodiversity into account. But city population and bio-score are just numbers, and even when they’re both far from optimal, Boss Nass will regularly ring you up with effusive congratulations on your success. (I wonder if I can turn him off like Jar Jar? Past a certain point, he’s just as much of a pointless interruption as Jar Jar ever was.) More important, to my mind, is the because-it’s-there factor. The longest possible food chain seems to be five steps, with the Rancor as apex predator. Keeping a five-step chain stable would be a considerable challenge, and thus something one could pursue for its own sake. Then there are some exotic combinations to pursue. I mentioned a carnivorous plant, the Tooke Trap. It can combine with the Shiro, an herbivorous turtle-analogue, to form the Shiro Trap, a bulbasaur-like symbiote: the plant grows on the animal’s back to provide the plant with mobility and the animal with camouflage. Creating a system with a stable Shiro Trap population would require enough set-up that you’d pretty much have to pursue it as an end in itself. But I don’t think I want to delve into it that deeply. Self-imposed implicit challenges are never a requirement for removing something from the Stack. 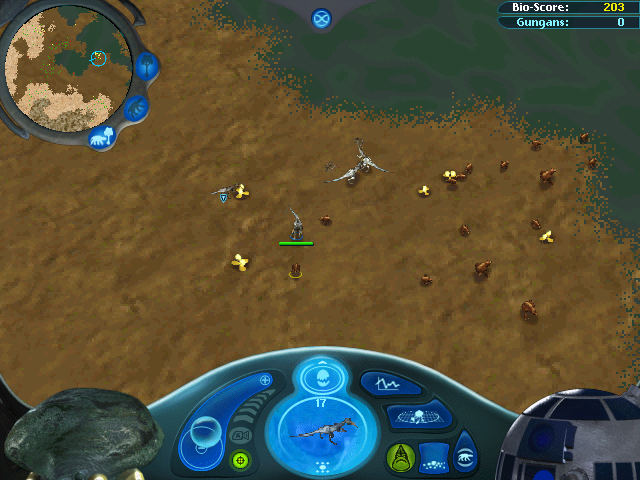 I’ve spent a significant amount of time fiddling with ecosystems on my own, and that’s all the game can ask from me. 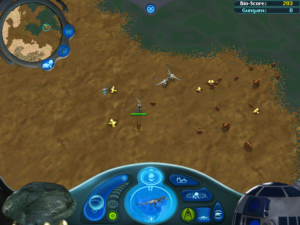 A random pick from the stack today: The Gungan Frontier (released 1999, bought by me maybe six months later when it hit the bargain bins) is basically an ecosystem simulation, the sort where life forms roam about a 2D world, eating each other and dying off when they over-predate and so forth. Countless computer science undergrads (myself included) have written sims of this sort, but this one is a bit more elaborate than most, with multiple overlapping food chains and varying terrain. And, of course, it additionally allows player interaction, mainly by means of seeding the environment with organisms you’ve got in storage. By my reckoning, there’s enough interactivity to make it a game, but it’s a game like Sim City, in that it’s not essentially goal-oriented. There’s a set of training missions with explicit goals, such as raising the population of a particular creature to a certain threshold within a time limit, but in the game proper, the only goal is to keep things going indefinitely. But even though there’s no win condition, there’s definitely a lose condition: your stores are finite, so if things go extinct, you can’t necessarily replenish them. There’s one other thing about the game that makes it particularly Sim City-like: the city. The whole premise is that you’re creating this ecosystem for the benefit of a space colony, which harvests the organisms for food and building materials. If you like, you can switch the main view from the ecosystem to the colony, watching it add pods containing classrooms and hospitals and the like as it gains the necessary materials, or, if you’re not doing so well, watching those pods gray out through disuse as the colonists move out. 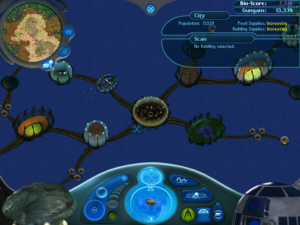 It really seems like the colony view was designed to provide some of Sim City‘s particular experiences and motivations, but because the only things you can interact with are over in the ecosystem view, I seldom look at it. It seems a bit of a shame, because someone clearly went to some effort to create it. The game was marketed as an educational game, but it seems to me to have aspects of what’s come to be called “persuasive” games as well. (I suppose these things are not clearly separable.) The whole point is to teach you the importance of caring for the ecosystem, so obviously there’s a bit of an environmentalist agenda there. But it’s a very non-specific environmentalist agenda, and somewhat muddled, what with its underlying assumption that wildlife exists primarily to be exploited. But consider how the harvesting of resources works. You can set the harvest rate for each species to a few rough categories: “None”, “Some”, “Lots”, “Maintain”, “As needed”. As far as I can tell, the “Lots” setting translates to “Render this species extinct as quickly as possible”. Although that’s handy in a few of the training missions, where you don’t have to worry about lasting consequences, it’s hard to imagine it being useful in a real game. No, the “Lots” option is not there to serve a gameplay purpose, but to convey a message, that unbridled consumption yields environmental devastation. I should probably mention that this is nominally a Star Wars Episode 1 game. This doesn’t make a great deal of difference; of all the Star Wars-themed games I’ve played, this is probably the one that has the least to do with the movies. (The closest runner-up for that honor is probably Pit Droids, a puzzle game also from the Lucas Learning line.) A few of the organisms are taken from the movies; for the first time, you get to see dewbacks, rancors, and dianogas in the wild. But the Star Wars movies don’t contain nearly enough plant or animal species to form an ecosystem, so the bulk of the critters were invented for this game. Boss Nass will occasionally send you a voice message about how the colonists urgently need more materials, and sometimes Jar Jar Binks will pop up to say something utterly pointless. Finding the option to turn off Jar Jar is one of the game’s most satisfying moments. It’s almost as if he was included for the specific purpose of allowing the player to disable him. So, you want to be an ARCADE champion?